In 1925 work began to have Mary MacKillop beatified and canonised, but it was not until 19 January 1995 that she was formally beatified. On 17 October this year, her canonisation ceremony will take place at the Vatican, followed by services across Australia to celebrate the occasion. The prepaid envelope features an image of Mary MacKillop with members of her congregation at Aotearoa (New Zealand) from 1895. 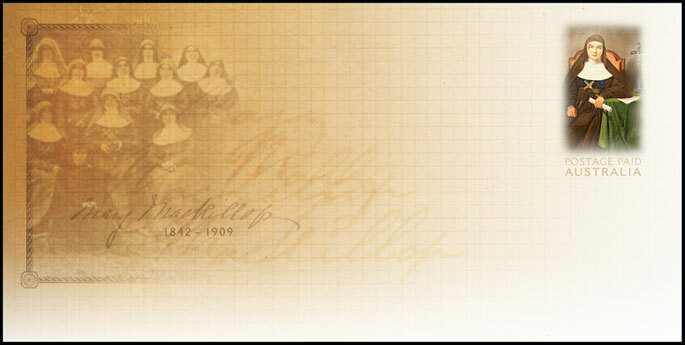 The stamp area of the envelope features an image of a painting of Mary MacKillop, by Raffaele Gagliardi of Rome.